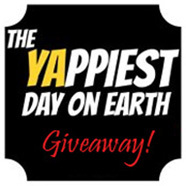 The 9th YAppiest Giveaway! is for the two “Necromancer” books, by Lish McBride: Hold Me Closer, Necromancer and Necromancing the Stone. These books are beyond amazing! I’ll contact you for your snail-mail address.